Ever since ARKit was a thing, countless developers have flocked to the new shiny tech in the hope of doing something interesting enough to get featured by Apple. My first experience with AR on iOS has been through PCalc which is a calculator app. The developer has built a full AR experience into the about section of the app that even has a remote controlled car segment. While a lot of games add ARKit functionality as a nice addition, AR Smash Tanks! ($1.99) from Dumpling is a lovely blend of mechanics. 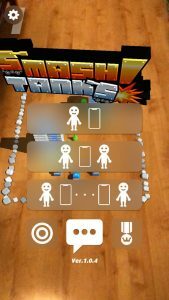 I’ve been playing with AR Smash Tanks! a lot recently and it has been pretty damn awesome. It checks off all the right boxes for me with its pickup and play nature, fully premium with no nagging ads or anything, catchy sounds, and simple but addictive gameplay. As the name suggests, you literally need to smash enemy tanks with your own tanks in multiround battles. 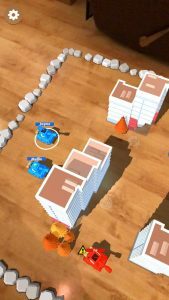 Controls are simple and you aim like you would in a pool game and shoot your tank into the obstacles in the environment or into enemy tanks. There are supply drops sprinkled at random that give you powerups like the power up boxes in Mario Kart. These range from shields to missiles and mines. Levels are randomized and the environment can work to or against you. 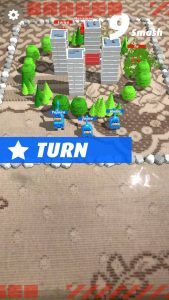 While you can play against AI controlled bots here in the main mode, this really shines when you’re playing against or with friends. If you only have access to a single device with the game, you can share the same device and pass it to your opponent. If everyone playing has a device with the game installed, the game really shines. I’ve played this on an iPhone 7 and iPad Pro. As with most games, I prefer playing this on the iPad. The only thing I don’t like about it is the icon. For a game that is nicely designed and one that has a nice interface within, I don’t think the icon lives up to the design quality of the game. If you’ve wanted some fun pickup and play arcade gameplay in an AR setting, give this a go. It is $1.99 on the App Store and Google Play.